Many Chinese tourists are currently preparing to travel overseas during the Lunar New Year celebration, which begins on February 16 and runs through March 2 this year. In the US, hundreds of thousands of retailers and service providers are ready to cater to these tourists by offering them the mobile-wallet payment options they prefer, such as Alipay. Almost two-thirds of Chinese travelers say that the option to pay by mobile is an important factor in choosing a retailer when shopping overseas. Alipay has been building out partnerships across retail, hospitality, leisure experiences and transportation in the US and is now accepted at more than 170,000 locations in North America. This Lunar New Year, Chinese travelers visiting the US can pay for hotels, apartment rentals, taxis, restaurant meals and retail purchases with Alipay. Many retailers and service providers are able to accept Alipay through point-of-sale and payment-processing intermediaries such as Adyen, First Data, Poynt, Verifone and Worldpay. Others have worked directly with Alipay to implement mobile wallet payments. Each year, Chinese tourists take more than 100 million trips, generating hundreds of billions of dollars in sales for retailers and service providers worldwide. These tourists are valuable shoppers who are known for snapping up apparel, beauty products and fragrances, food and beverages, and electronics in particular. Chinese consumers are currently gearing up to take trips to mark the Lunar New Year holiday, which falls on February 16 this year, although festivities will continue through March 2. The holiday is a popular time for overseas vacations, and US retailers and service providers are better prepared to serve these consumers this year. In particular, a large number of US businesses have begun accepting Alipay over the past year. The mobile wallet service is used by more than 520 million Chinese shoppers, and many of them prefer to use it for purchases when traveling abroad. Alipay told us that it has been building out partnerships across retail, hospitality, leisure experiences and transportation in the US, and that more than 170,000 locations in North America now accept payments made through Alipay. That means that this year’s Chinese New Year will mark the first time many US stores and services are set up to cater to Chinese tourists wanting to pay using a familiar mobile wallet service. In this brief report, we note how US retailers and service providers are catering to Chinese tourists by offering Alipay and list some of the types of businesses that now accept it as a payment method. First, though, we summarize the scale of the opportunity that Chinese tourists represent. Chinese tourists spent an average of $2,335 each during their most recent overseas trip. Those visiting the US spent even more, at $2,733 per trip on average. We estimate that total overseas spending by Chinese tourists reached $315 billion worldwide in 2017. We further estimate that the total number of outbound Chinese passenger journeys grew from 122 million in 2016 to around 135 million in 2017. Chinese consumers lead the world in the adoption of mobile payments. At home and abroad, these consumers want to be able to pay for their purchases using mobile wallets such as Alipay. 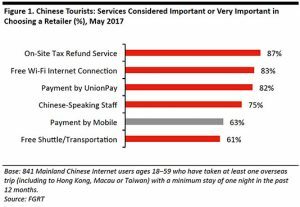 Already, almost two-thirds of Chinese travelers say that the option to pay by mobile is an important factor in choosing a retailer when shopping overseas. Why Do Chinese Tourists Turn to Payment Apps? Chinese consumers are familiar with the Alipay Mobile Wallet. The company claims more than 520 million active Chinese users. Alipay users receive special discounts and deals. Users can see the exact price of items and services in renminbi when they are paying in other currencies. Alipay eliminates language barriers by communicating to Chinese consumers in their own language. The app’s security features instill confidence in tourists, so they feel comfortable when shopping overseas. Travelers have access to Alipay’s financing and credit options. Many US retailers and service providers are now able to accept Alipay thanks to recent partnerships between Alipay and point-of-sale and payment-processing intermediaries such as Adyen, Citcon, First Data, Poynt, RiverPay, Verifone and Worldpay. Other retailers have worked directly with Alipay to implement mobile wallets as a payment option. Given the extension of Alipay partnerships over the past year, Chinese travelers can now use the mobile wallet service to pay for hotels, apartment rentals, transportation, restaurant meals and retail purchases in the US. Below, we highlight some of the goods and services that travelers to the US can pay for using a mobile wallet service such as Alipay. Alipay is now accepted by 850 merchants in Las Vegas, the stores at Woodbury Common Premium Outlets in New York, and merchants at Fisherman’s Wharf and Pier 39 in San Francisco. In New York’s Flushing neighborhood, in Queens, more than 300 businesses now accept Alipay. Shoppers can use Alipay to pay for purchases at fashion stores such as Rebecca Minkoff and Lacoste. “Hot pot” restaurant chains such as HaiDiLao, Little Sheep and Liu Yi Shou all accept payment by mobile wallet. Airbnb, Caesars Palace in Las Vegas, and Luxe Hotels and Sheraton Hotels in Los Angeles are some of the lodging businesses that accept Alipay. Travelers needing ground transportation can use Alipay to pay for rides in Uber cars and more than 16,000 taxis in Las Vegas and New York, including traditional New York yellow cabs. Entertainment venues that accept Alipay include Universal Studios Hollywood. Over the approaching Chinese New Year holiday, we are likely to see millions of Chinese tourists use mobile wallets such as Alipay as they travel and shop overseas.